Apparently there are only 100 days until the Olympics start which also means we only have the same time until our expedition to Thame this summer. The tasks and activities to enable us to operate there are underway and this week saw some of the ground works necessary at Thame being completed. The work was to clear ground to provide easier access to and from the hangars and more importantly to provide extra space for trailers and gliders that we will have there. The team was very ably led by John Herman (in his warm and dry digger) and Pete Wyld (on his cold and wet dumper!). Between them they moved around 200 tons of soil. They were assisted by Simon McCracken, Rob Turner and Adrian Hegner on shovels for some of the more delicate but necessary ground works. To improve access to and from the hangar a soakaway was dug and about 10 tons of 'type 1 chippings' spread around the entrance area to the hanger to improve things when its wet. The rain throughout the day gave us the chance to confirm that they had significantly improved the situation. There is still a lot to do and your help will be greatly appreciated - please watch the notice boards/newsletters for 'calls for help'. For several years now, Booker has hosted the Annual Easter Egg Aerobatics Competition. Part of the tradition seems to be that, due to inclement weather, it's not actually held at Easter and is delayed until the folowing weekend. This year, Graham Saw tricked the weather by holding the competition the weekend after Easter. This ruse worked because we had a cloudbase of 3,000'+ with a high level overcast layer kiling off much of the thermal activity in the early part of the day. Whilst enthusing about thermals being damped down is anathma to soaring pilots, to those doing aerobatics it's a real bonus as it makes the sortie smoother and safer (no sudden gust loads experienced due to those pesky 5kt thermals getting in the way!). And so it was that conditions were pretty ideal. Graham arrived early to ensure the K-21 was cleaned out (loose objects, dust & lumps of mud are not a good idea when you're doing aerobatics!) 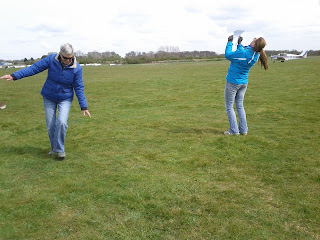 and took the glider out to the launchpoint in readiness for the day. I was asked to judge the competition and entered into the spirit of things by enjoying a relaxing coffee and chat in the clubhouse whilst everyone else was outside in the cold getting the kit ready. Such was the banter in the clubhouse that I nearly stuck around to listen to Jim White's X-C Performance lecture before twigging that I really ought to see if there was anyone at the launchpoint. As the day went on the enthusiasm grew and with seven pilots taking part, most of whom did two flights, attempting either the "beginner" or "Tricky" sequences it became quite busy. All pilots showed considerable enthusiasm and quickly gained insights into competition tactics (most important one being - be nice to the judge). All flying was conducted to a very high level of competence and safety (with Graham acting as safety pilot where needed). These are an excellent set of results and congratulations are deserved by everybody who took part. Jane & Chris were awarded the competition trophy (which Chris made the previous year!) and everybody received customary Easter Eggs as prizes! Wooo hooo! The evening groups have started again! Considering the impressive cunim's crowding the sky (see previous post), I rode to Booker thinking I would be met with an empty clubhouse and a note on the window saying, "Are you mad Brian? Fly? Tonight? Have you not seen those cathedrals of doom in the sky? 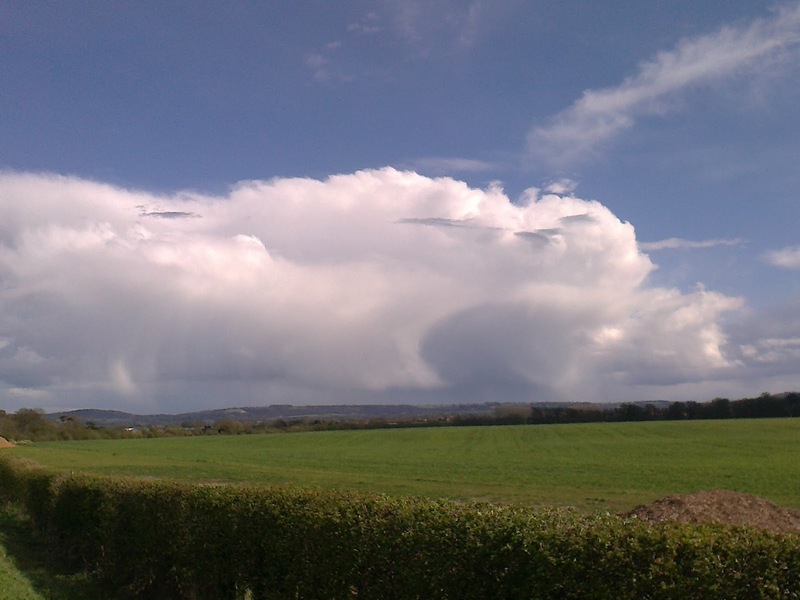 Have you not read your lapse rates?". As I dismounted and walked towards the clubhouse, hail hammered into my helmet. Oh well - at least I showed willing. "Are you ready to fly?" "When did you last fly? At this I must make a confession - I haven't flown since September.... unfortunately my circumstances mean the evening groups are the only times I can slip the surly bounds... and all that. By the time we had wriggled glider and tug from the clutches of the hanger the weather gods relented and between 7pm to 8pm yesterday Booker was slap bang in the middle of a lovely weather hole. We had cunims' over Alyesbury and south of Heathrow - but nothing close. With Richard in the tug, Graham in the back seat, a nifty tyre under the windward wing (no wing runners see!) we were ready. I'm not sure what outsiders in 'the pad' thought of our ensemble: To the untrained eye, they would have seen two grown men enter a vehicle, close the 'window', then watched as the windows steamed up and the vehicle waggled and rocked! Enough innuendo! 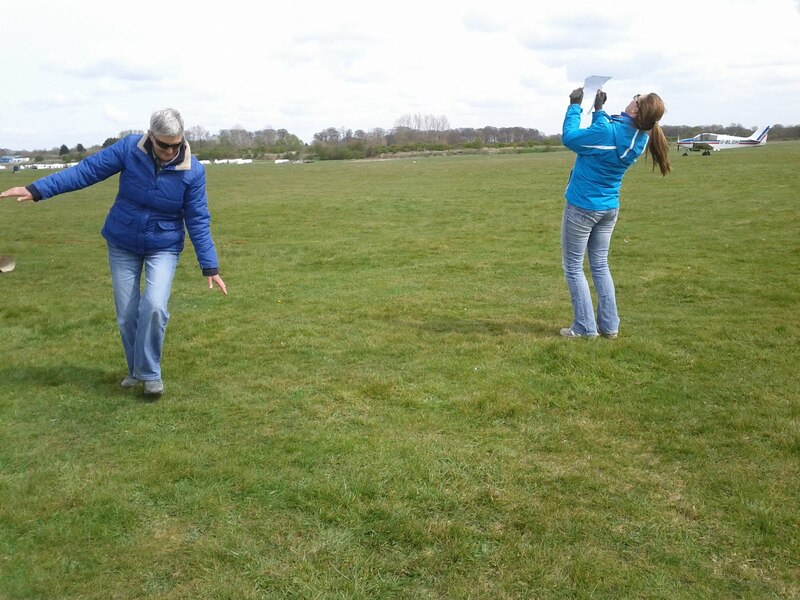 We trundled off down the grass into the blue yonder with a hop, skip and a jump. As ever Graham devised fiendish tasks on and off the tow. Off the tow we rumbled about the sky on the point of stall as a test of flying accuracy: This however supports my theory that Graham has two speeds in a glider - plummeting to earth at Vne gathering the energy to corkscrew about the sky, or flying slower than stall... preferably upside down. As we plonked back down on terra firma, with a clean bill of health, I set off again on my own. Ah the joy! As air whispered passed the canopy, and we got above rope break territory, the panorama was wonderful: The storm clouds in the distance were beginning to turn pink with the setting sun. Planes in the stack south of Heathrow lent scale to these monsters of energy. Passed Aylesbury the grey touched the ground with curtains of mist and rain. Yet in our hole, for miles around the air was benign and welcoming. In fact a tiny line of lift kept us aloft for a few more minutes. I know there have been some amazing cross country flights so far this year - but for me, just being in the air and teasing even the tiniest bit of energy from the sky feels like an award justly won. 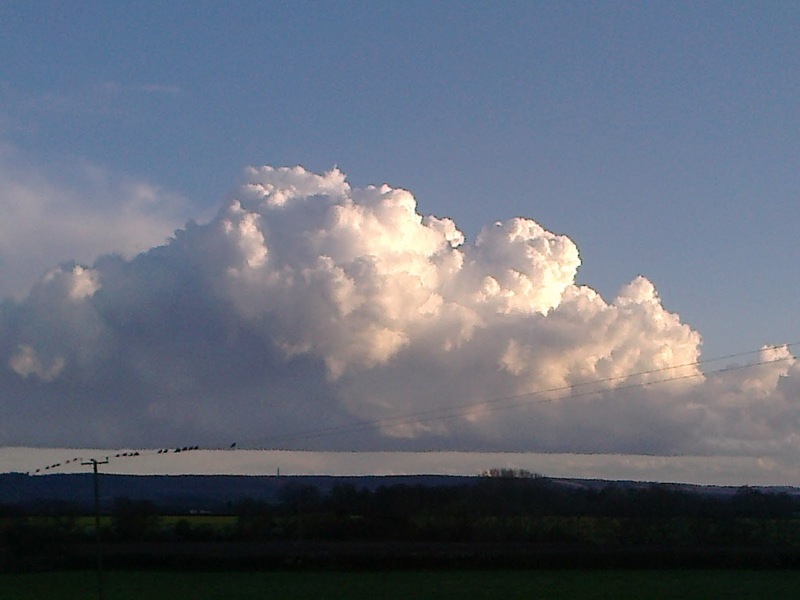 View from Haddenham towards Risborough this afternoon. A bit lively. The sun and heat of last week have been replaced by snow and frost but flying continues with every possible day being used to the full. 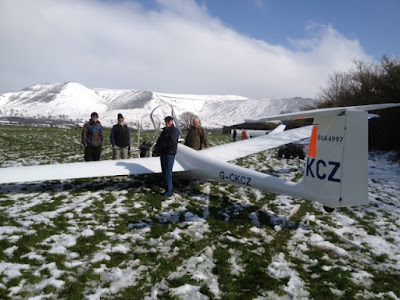 On Sunday BGC members clocked up 15 flights with a culmination of Mike and Graham taking the last launch and having a 1½ hour flight which took in Brecon and Hay on Wye thanks to good thermals and an increase in the breeze producing the right ingredients for flying the ridge at the end of the day. 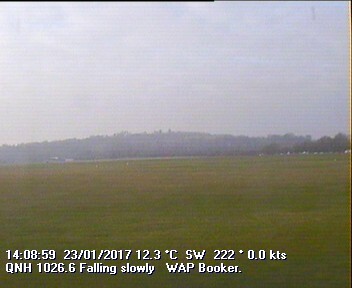 Monday was overcast until midday but still 9 flights were achieved including Glen enjoying over 2 hours in his own glider and Rolf putting the Junior to good use with a 1½ hour flight. Tuesday provided a brief window for 3 launches in the space of ½ hour with Jeremy having the opportunity of flying in the BMGC K21. With superb timing the gliders were de-rigged and in their trailers one minute before the rain arrived. In the afternoon the major achievement was a height gain of over a 1,000 feet by Lee, Glen, Vic and led by Jeremy up to the ridge returning safely after 3 ½ hours of strenuous activity. On Wednesday the snow arrived plus wind and sleet, so a second visit to the “Big Pit” filled the day. Excursions continued on Thursday thanks to Rolf organizing a visit to Talgarth Mill which in the past two years has been beautifully restored and is now milling the local grain, the adjoining café kept everybody happy with cake and coffee. By the time we returned to the airfield Don (BMGC) was ready to fly the Pawnee launching on a snow covered airfield. A “test flight” with the local K13 provided encouragement to launch the K21 resulting in 4 flights culminating in Lee demonstrating his aerobatic skills. It seems that the Booker team at Talgarth have swapped T shirts for thermals, to judge by this photo. Week 1 of the expedition draws to a close with another day of sunshine forecast. 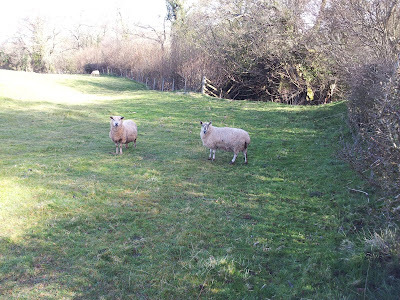 In recognition of Booker's support for Talgarth, Black Mountains GC has kindly offered the loan of two of the sheep used to graze the edges of their airfield to tidy up the area behind the Booker trailer park. A glider pilot/farmer from Talgarth who regularly visits Henley will keep an eye on them. We just need to raise £50 to cover the cost of fuel to bring them to Booker and return them at the end of April so if you would like to contribute £1 towards this, please hand in your donation at the office. Saturday was a bit damp and grey, so after some model aircraft repair work a group visited the Big Pit museum at Blaenavon, where we were given an in depth experience of the life of a miner. Recommended.